So I’m trying to catch up on all the things I want to do with this blog… stuff like updates from the cooking class a week ago, and starting a new section on local Gluten Free Bakers, and I’m pooped. I’ve also been wrangling with a yeast free, gluten free, nut free, flax free, xantham free bread. Err. Easier said than done. Anyways, in the middle of this, a girl has to EAT. I’ve been snagging pieces of test loaves of bread all day, and really all I want right now is some simple greens. Ever make a recipe thats so simple you wonder if you might be missing something? That it cant possibly be THAT good with so few ingredients? That was me about 30 minutes ago. And then this delicious little side dish did evolve and I just had to share before diving into making yet ANOTHER experimental loaf of bread. Chinese cabbage, I have no idea if there is an official name for it. 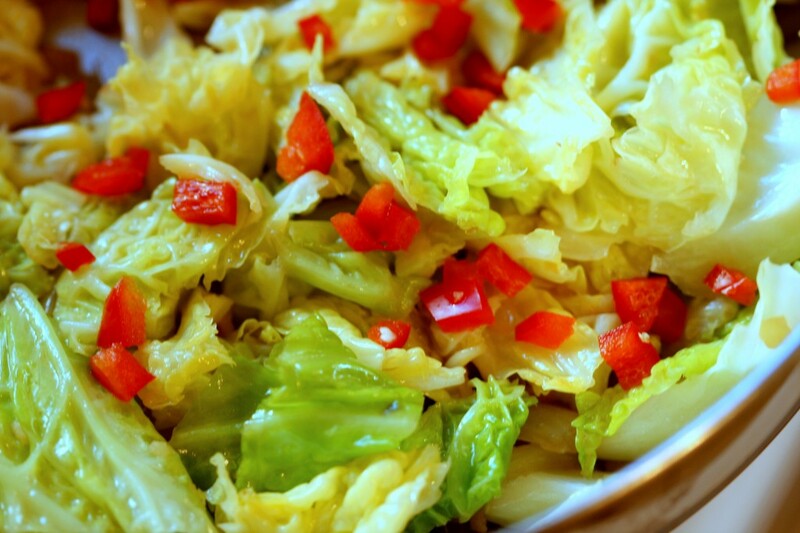 Its crunchy, almost like lettuce, and pairs beautifully with fresh ginger and a little onion. If you can’t eat onion, then try subbing in some chives just before serving, or cooking some finely chopped leeks with the ginger. Also, if you can’t handle cabbage or sulfer vegetables (ie broccoli, cabbage, cauliflower etc…), try this recipe with spinach, swiss chard, or bok choi. Here we go! A simple beauty. Heat the olive oil in a frying pan on high heat. Add the onion and ginger and fry on high heat until the onion is translucent. Keep on high heat. Add in the chinese cabbage and stir constantly to prevent the onion/ginger from burning. When the bottom of your pan starts getting a layer of cramelized bits stuck to it, pour in the water. 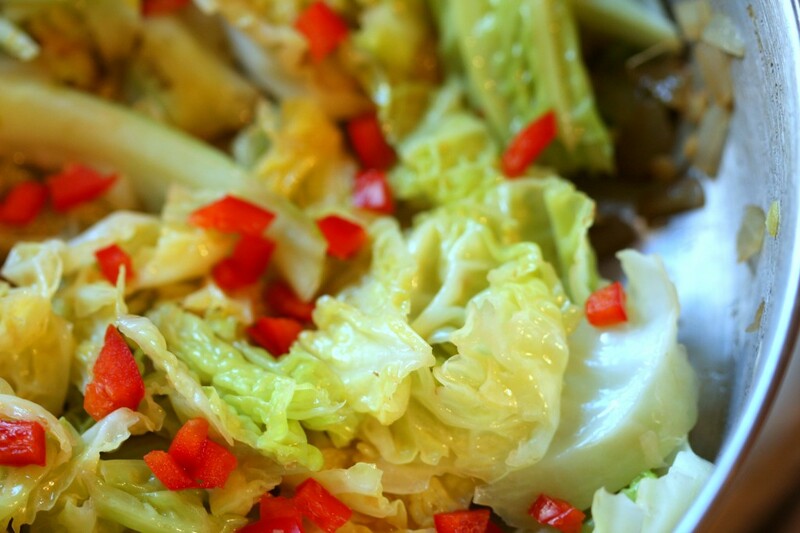 You’ll get sizzling and steam- keep stirring so that the cabbage gets evenly cooked. Toss with finely chopped fresh red pepper and serve. Note: Main meal : this would be delicious as a main meal with some chicken or a light coloured fish like tilapia tossed in, or for vegans, with tempeh or throw in some roasted sunflower or sesame seeds.